Don't Be Afraid of Raising Your Prices. Here's Why. Blog » Marketing » Don’t Be Afraid of Raising Your Prices. Here’s Why. Was there ever a time that you felt compelled to raise prices, but you just couldn’t because you were afraid your customers wouldn’t like it? Perhaps you felt that if you were to raise your prices, your customers would leave you for your competitors, which, if bad enough, might cause you to go out of business altogether. In some cases, raising prices can have a detrimental effect with customers, but for many businesses, raising prices is the only way to continue making a profit. If your business operates in a super-competitive market with low profit margins and larger players lock prices down, you generally won’t have a say with pricing. On the other hand, if you’re in a narrower niche, there’s no reason why you shouldn’t use price as a tool grow your revenue and bottom line. For any business owner, the moment when it’s time to charge your customers more can be a tough lesson in patience and managing your fears. Feeling nervous is normal. After all, as a customer yourself, you probably aren’t keen when your mechanic, the coffee shop you go to, or the ad agency you work with raises prices. In an ideal world, your business should be able to raise its prices to keep up with inflation every year. But things are far less smooth in the real world. Still, you need to go over your rates on an annual basis, comparing what you charge your customers with overhead costs and the general condition of the economy you’re in. If business is slow, a price increase might not be wise. On the other hand, if you’ve been holding off on an increase for a few years, a price hike may be long overdue if you want your enterprise to survive. Big companies have had to do this. And for some, like Netflix, there was some damage. But price hikes don’t have to spell disaster. 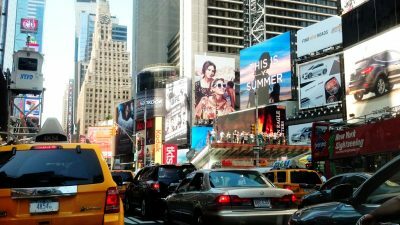 Sometimes, business leaders are so fixated on their customer happiness that they fail to see the bigger picture. While most business owners believe that customers are the lifeblood of their enterprise, this is not exactly 100 percent correct. Instead, the right customers are the lifeblood of a business. Both have different benefits, but involve a common denominator: price. Your pricing sets the tone for the kind of company you want to be and the type of clientele you intend to serve. On the one hand, you could be a low-cost service provider. But bear in mind that customers don’t expect customer service to scale with the lower price they are paying. On the other hand, being a high-cost service provider looks like an envious position on paper, but this also means you need to justify your higher fee structure. There is no right or wrong between the two situations. Only you can tell if one or the other matches your business goals. In fact, many businesses tend to gravitate towards the center, raising prices but doing so sporadically and not with significant increases. If you’re mulling a price increase in your company, below are a few reasons to help you make a decision. The interesting thing about managing customers is that more often than not, it’s more expensive to acquire new customers than to raise prices and explain the reasons for doing so to your existing customers. In fact, according to the Consumer Affairs office in the White House, acquiring a new customer is at least 6 to 7 times more expensive than simply retaining existing customers. In other words, quality is better than quantity. As your business’s increases in costs are not the same as the increases in price, most of the revenue you get from increasing prices goes to increasing profits (revenue minus costs). As mentioned earlier, the right customers are what matter most to a business. Although high utilization is often a good indicator of a healthy business, it can also be a sign that it’s time to increase prices. 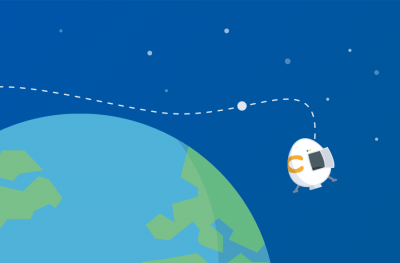 As backward and ridiculous as it sounds, your customers might be holding you back from growing. If you’re so busy with low-quality customers who constantly complain or are slow to pay, a correction by virtue of a price increase should help separate the wheat from the chaff. If you raise your prices, your low-quality customers leave and go elsewhere, leaving only those who know you’re worth paying more for. Good customers tend not to complain about minor price increases, especially if they know you provide a level of service that reflects the amount you charge them. Don’t know if you should raise prices? Look at what your competitors are doing! 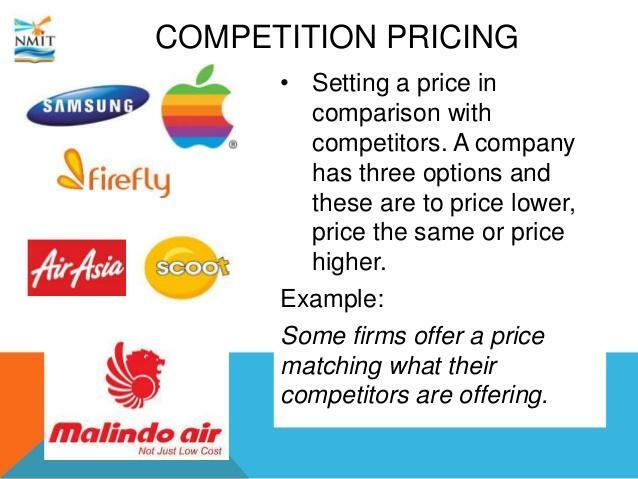 Your competition will provide a benchmark that should help you devise your pricing structure. If your rates are too low, develop a strategy that will allow you to catch up with competitors. For many businesses, the common strategy is to price products and services well below market during the initial months of operations, trending upwards within a certain timeframe. While it’s important not to be shy about increasing your rates, you still want to do so in such a way where you can provide valid reasons for your new rates. This will often mean spending time figuring out what price range your enterprise can survive with. If you’re upfront and transparent with your reasons for increasing prices, your customers will understand and even appreciate your being proactive about the company. Often, increasing the price point establishes you as the quality leader in your industry. The right kind of customers — those who can and will afford your product or service — will buy from you. The simple act of raising prices sets you apart, and improves your perceived value. The point here? Read on. You’ve probably heard of the saying that goes, “You get what you pay for,” when talking about the quality of a cheap product. If your price of an item is too low, many buyers will think it’s defective. 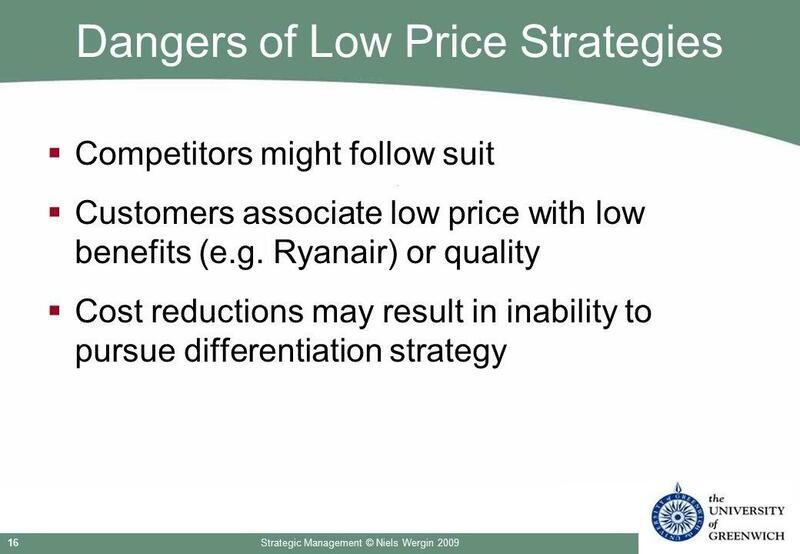 Furthermore, low pricing tends to attract customers with no loyalty to anything besides their wallets. Price increases show potential customers you believe in your product and know it’s worth the money you’re charging. Raising prices will force you to improve other factors that need to be in top shape to justify and sustain your price hike. Improve service levels – Poor customer service is a consistent pain point cited by customers for changing providers. Include high-value items to customers – These can be given at little to no cost to customers, such as free shipping, 30-day money back guarantees, great return policies, and much more. Focusing on your product or service value tends to be more sustainable in the long run, showing that you’re just as willing to work on your customers’ experience as much you care about how much they spend. The apprehension many business owners feel when raising prices is understandable. After all, who would want to lose customers? But while some of your customers are probably with you because of your price and only because of it, they are arguably the minority next to your customers who care about other intangibles. These include your level of service and product value among others. True, your revenue could be at risk because of your lost customers, but there’s a good chance you’ll still see increased profits from your price hike. You can easily calculate the number of buyers you can afford to lose in light of your new pricing structure before your revenue takes a hit. 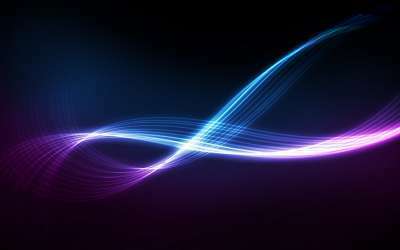 For example, if your business runs on a 60 percent gross margin and you increase prices by 10 percent, you can lose no more than 9 percent of your customers before the prices negatively affect your profits. Often, businesses raise prices because they have to, not because they want more. 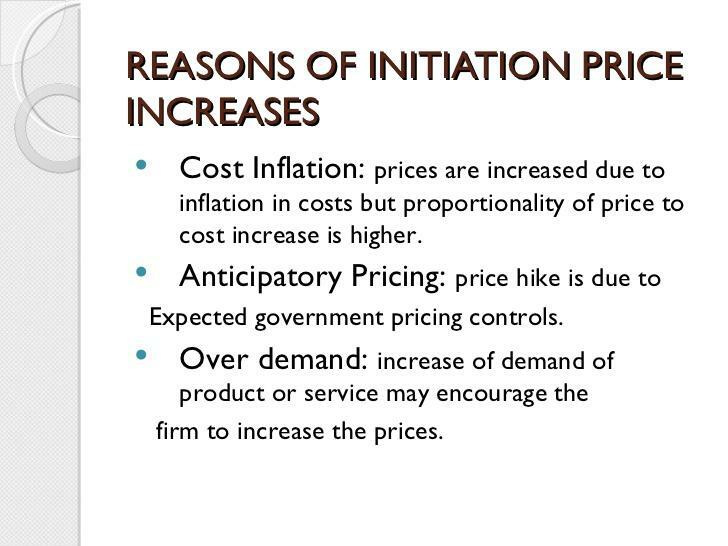 Price increases usually happen when operating costs rise and the enterprise needs to maintain current profit margins. 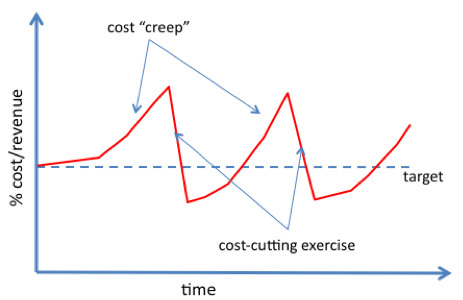 The image above shows the problem of “cost creep,” which happens when costs begin to rise due to factors like wage adjustments and inflation. Because these factors are out of the business owner’s control, and cost-cutting can only do so much, you’ll have no choice but to pass on these expenses to your customers in the form of a price increase. Each year, be sure to look at your pricing and your business’ financial health. Remember that failure to increase prices when you can, may result in a revenue crunch when you need your business to scale. Raise prices when necessary, but don’t be greedy. While it’s important to make a profit, any increases in your pricing structure should be defensible. Otherwise, your customers will see you’re just trying to more of their money, and end up not wanting to do any business with you in the future. Have you had experience with a price increase? How did you manage it?